We can agree that something is common sense as long as we share the same set of assumptions. I think people really don't understand how much of a problem this is, because they assume that what they think is common sense is right. Someone was just telling me the other day that she was mystified at how we couldn't just use common sense to make policy. It seemed completely ridiculous to her—why isn't there someone in politics who could say that it's common sense that everyone should have equal access to healthcare? But that's a belief that is deeply disputed! And people who disagree with her also feel that they are using common sense. So common sense is actually very good for resolving everyday situations, where everyone shares the same set of assumptions. The problem is that it feels so effective to us in these circumstances that we're tempted to use it to make decisions and plans and predictions about situations that are not everyday situations. What it all comes down to is that pretty much everything seems obvious to us when we believe we know the answer, and so we make simple assumptions about complex situations. This causes us to disagree with one another over things we haven't really thought through as much as we may think we have. While we're wired to make these kind of assumptions, we can keep ourselves from getting too attached to them by keeping in mind that even our most valued beliefs could be wrong. This is just one more good reason to always keep an open mind. There is no such thing as common sense. Sense is a rare beast. I submitted that Einstein quote some time ago to BrainyQuote, and it somehow appears on their site a bit butchered. I "discovered" this quote at an auction gallery in NYC. It's from the early 1950s. Now it's copied incorrectly all over the web. "Common sense invents and constructs no less in its own field than science does in its domain. It is, however, in the (naive) nature of common sense not to be aware of this situation." The first "in" was incorrectly replaced by "than", and the word (naive) - in parenthesis indeed! - was missing. This substantially changes the nature of the quote. The corrected quote now makes the point that common sense itself is too naive to realize how inventive and constructive it actually is. And makes Einstein seem that much more brilliant AND thoughtful. If common sense was a virus, humanity is immune. About the best you can do is claim common sense comes from a common experience. Otherwise it is a meaningless concept. If common sense were common, more than half the population would have it. Ignorance seems to be more common than hydrogen in the universe. 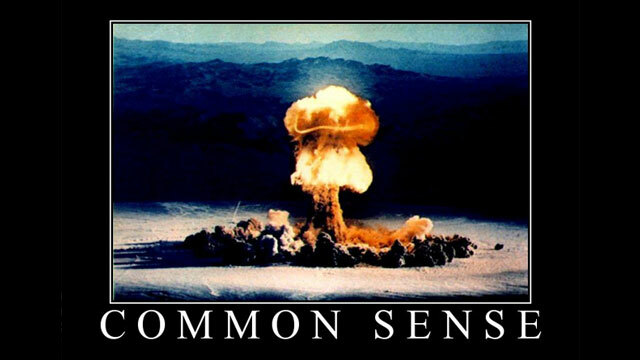 What I have seen and heard to be "common sense" has often ended in disaster and is mostly nonsense. No one is born with knowledge or reasoning. Few know how to detect a fallacy, much less follow a line of logic. So, that which is considered "common knowledge" or "common sense" is like a Unicorn. It is a myth that sounds good and makes us feel less anxious, but it is an exercise in self serving self delusion.